Just over five weeks ago, I witnessed a small slice of Heaven when my third daughter was married at St. Matthew’s Catholic Church. Three of my four daughters have now received the Sacrament of Marriage, and my wife Denise, our families and friends have all experienced three special insights into Heaven-the eternal banquet, the eternal wedding feast! 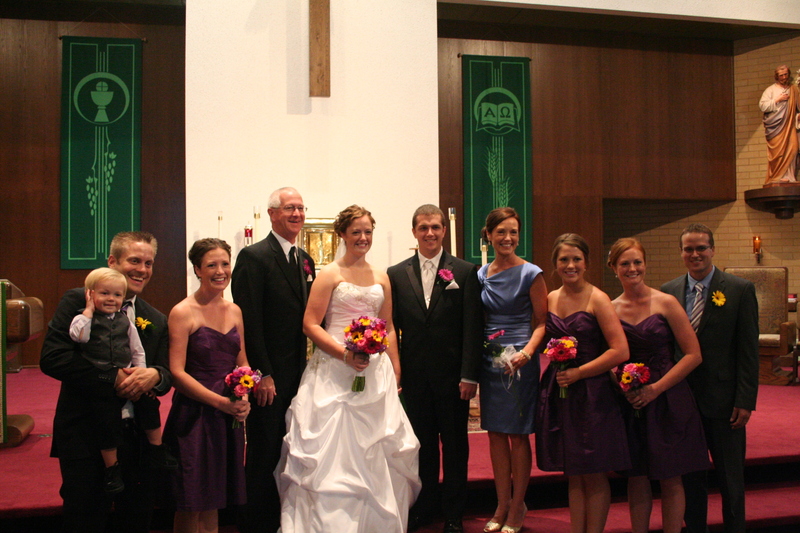 And my three daughter and their husbands now share in a special fraternity-millions of couples united with Christ in a covenantal marriage. Today marks the 60 anniversary of my parents wedding. Sadly, however, my mom passed away on September 22nd, just 12 days shy of this tremendous accomplishment. But I believe that the glimpse of heaven she had on October 4, 1952 is now within her grasp-she has become part of that banquet. And I am proud of her and my father for living out this sacrament for 60 years, through five children and all the responsibilities of their care and upbringing. Denise and I have been married for over 33 years, have four children, three sons-in-law, and one fantastic grandchild. We continue to marvel about all the blessings we have received these 33 years, blessings that far outweigh the occasional sorrows. And we continue to believe that the daily grace we receive from the Sacrament of Marriage constantly nourishes our relationship with each other, with our family and friends, and with our faith. My hope for this blog is that, coupled with the one-day retreats that we offer at Our Lady of Mt. Carmel, and the continuing education for married couples planned for our parish, that every couple reaches and exceeds that milestone that my parents missed by only 12 days. And that ultimately the brief snapshot of Heaven we received on our wedding day becomes a panoramic reality for us when we sit down at the heavenly banquet promised to us. This entry was posted in Uncategorized and tagged Love's Sacred Embrace, sacramental marriage, Theology of the Body by joeindy. Bookmark the permalink.